As many of you may have witnessed first hand or heard, we have begun a literal occupation of Wall St. We’ve been there since the 9th of April. After a week of being allowed to sleep on the sidewalks, the NYPD suddenly changed the rules and kicked us off the sidewalk. We sought refuge on the Steps of the Federal Building and in response barricades were erected creating essentially a freedom cage where people are “allowed” to assemble. Yesterday there were even more new rules enforced. The rules change every day in a dizzying display of violations of our 1st amendment rights, ironically at the feet of a giant statue of George Washington. We are there to bring the conversation to the source and the response from the police state has been overwhelmingly fierce in their attempt to suppress our voices from being heard. This People’s Assembly is an attempt to begin to reclaim our right to peaceably assemble on Federal Property and to assert it in the face of the authorities illegal repression. We are hoping, if the community is excited about it, to start having a weekly People’s Assembly on the Fed Hall Steps focused on What We are Here For. Federal Hall: inside they introduced the Bill of Rights, outside they killed it. 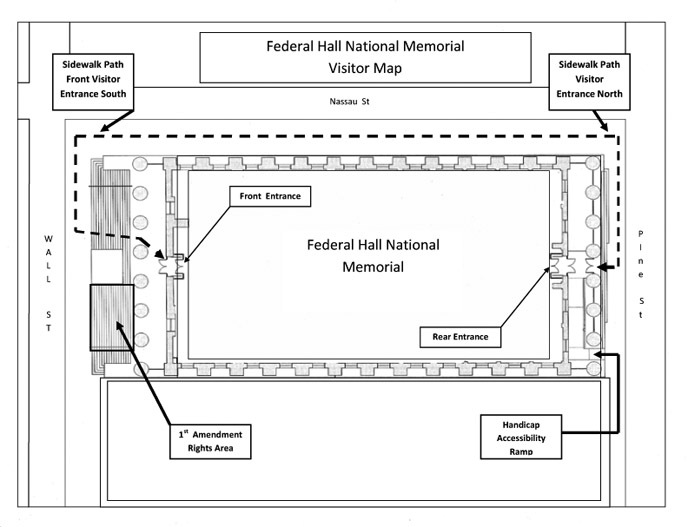 According to an updated diagram, the Federal Parks Service has barricaded off a small area on the front steps of Federal Hall, called tellingly, "The Amedment Rights Area" for the protection of free speech. Freedom Cage or Obama's Cage is located just to the right of George Washington's statue. Ironically, this is the building where the Bill of Rights was first introduced. It also served as the first Capital of the United Stated of America and is the site where George Washington was inaugurated. "The First Ammendment Right's Area," also called the Freedom Cage and Obama's Cage, protects the freedom of speech behind the barricades - for a maximum of 25 people at a time. The barricades themselves potentially form a fire hazard, blocking access to entry and exit, but only for those exercising their first amendment rights. This move indicates increasingly repressive measures by both city and federal government to limit access to free speech. First they attacked a 2000 court ruling allowing people to sleep in the name of political protest that allowed for the compliant action #sleeponwallstreet. Then, when denied the expression of free speech by the city government, occupiers took refuge on the steps of Federal Hall under Federal Jurisdiction, seeking to exercise first amendment rights. The federal government has been loathe to comment on the Occupy Movement. (The President was conveniently out of the country during the 18-city raid of Occupies across the country. Despite using "Occupy Language" in his State of the Union addres, he has yet to officially comment on the matter. )The Federal Park's service under whose jurisdiction Federal Hall falls threatened federal time for anyone arrested on the steps of Federal Hall. This seems to be an intimidation tactic as high numbers of arrests on Federal Property would force the President to comment on the local and national government's suppression of freedom of speech. The current rules of the steps: no sleeping, no sleeping bags, twenty five people at a time, no drums, no noise after 8pm. The barricades and the location of freedom cage limit occupiers' ability to engage with the public and tourists. These rules of engagement remain subject to change as the mercurial tides of the government and even individual law enforces have changed the rules so many times Occupiers have taken to chanting "I get confused when the law changes everyday." As for select enforcement of rules and ordinances, a quick stroll down the block one night revealed Ciprianni's just a bit further down Wall Street was having a bumping party, that although audible for a block in every direction, to the best of my knowledge has received no noise complaint. If we're engaged in lawful acts of protest, aren't we protected by the court? Doesn't that make interfering with the act of protest a crime in itself? Admittedly, I'm a thousand miles away and in no position to help with this, but could the legal aid folks start drafting paperwork to sue these folks, individually and collectively? Maybe I'm just naively hoping that the courts will uphold the real laws, not the recent ones that have been passed specifically to suppress the Occupy movement. I just think that they deserve one more chance to allow reasonable discussion. If they really want to take peaceful protesters and cage them like animals, they need to find out what non-peaceful protest looks like. But by all means, let's give them one more chance to be rational. Also, I just want to say how much I appreciate the Occupiers in NYC and Oakland and the other 'first wave' camps. Now we know what to expect when things heat up in middle America. GET OUT OF THE CAGE AND PROTEST. That cage is an insult to our basic human rights and a blatant slap in the face of the movement. Forget the "people's microphone" and get out of the cage. Get in their faces and let them know we will NOT take it anymore.